Patti wrote: Fantastic illustration/resource supportive of my position. Patti, your talk about 'disturbance' or 'break' in the thenar crease in that picture shows how you process info by putting far too much value on arbitrary details; because the picture-zone that you mention does not show much more than a small irregularity in the drawing picture. By fact, the book does not describe anything about the continuation of the thenar crease at all! I think your claim regarding the picture can therefore be described as absurd; because if you had studied the full picture by detail... you could have noticed that for example in the same region the line which represents the boundaries of the 3rd metacarpal bone also are not drawn with a stable colored line at both sides of the thenar crease - see especially the 2nd picture below! Patti, those pictures just a few drawings (probably made by an artist)... so you're putting far too much value to arbitrary visual details of which the value is for sure not confirmed by the descriptions in the book at all. The book only mentions the word 'thenar crease' 4 times so it does not present a detailed treatise of the line; and the book only describes how the 'pronounced oblicity' of the line reflects the opposing movement of the thumb (see page 1). The illustration above shows an even longer version of a Line of Mars or inner life line not identified as a thenar crease. Perhaps that is because it might be considered as part of the "relaxed skin tension lines" that run parallel to the thenar crease (see text below illustration). The picture shows a perfectly normal 'attached' life- and head line. And the mars line clearly starts at the radial side in the center of the upper thenar zone and it's length is also only very typical for a mars line. So I could describe it as delusional to suggest that this picture presents a clue about to understand the lines that we have discussed in this topic. The directions of the branches at the wrist area of the thenar crease are not based on whether it's a fate line or a life line, they relate to nerves and the direction they go. "They noted that a thenar branch of the median nerve with a transligamentous course correlates in a significantly high number of cases with ulnar terminal branches of the longitudinal thenar crease. In contrast, radial terminal extensions of the thenar crease suggest an extraligamentous course of the nerve." They are called the radial and ulnar terminal extensions of the thenar crease. In palmistry that includes a basis in science, this short inner line should not really count as a short life line if there is another crease defining the boundary of the thenar pad. 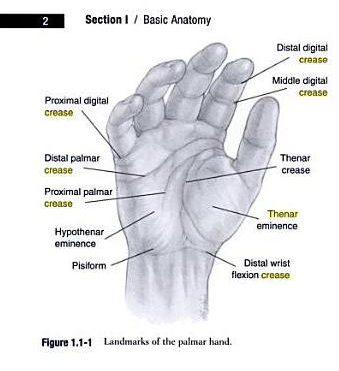 Patti, the quote (from "Surgical Anatomy of the Hand" Schmidt - Lanz) only describes a relationship between the terminations of the thenar crease and the underlying nerve system. 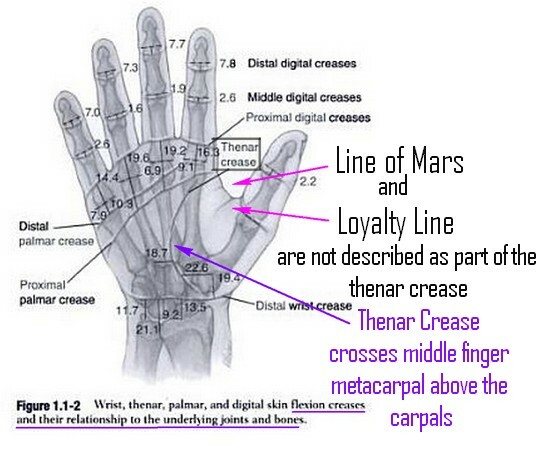 The sagittal crease is not mentioned at all... so I don't understand how this info could help us for finding the nature of the line - as we can not study the nerves from a hand print! It looks like another absurd attempt to suggest that this info puts any support to your individual approach (I have not seen other participants sharing likewise speculative ideas). Let me make two things clear. 2) The palmist was not aware of the patient's age. Even when he had inquired, he got a wrong estimate. For the palmist, he was giving prediction at least 2.5 yrs ahead. 3) Hence, you are drawing a conclusion (The person was sick and likely to die soon. Hence, the prediction is more of a guess work - paraphrasing the intent your comments, as I have understood) is a wrong one. The point is - I have seen such longevity predictions & I am ready to believe that such prediction is possible in short term. No amount of theories can substitute an observed event. Yes, long term predictions are difficult. Because an observed defect may get modified / strengthened by a repair line etc in course of time. Or a perfect feature may get weakened in course of time. I understand your arguments, but I think your initial description of the 'successful prediction' did not present much details regarding the circumstances involved. Thank you for sharing a few more details, but I think the missing of 'age' could very well be essential here! But I think there is something else missing in your report regarding the possibility to accept the report as 'proof'; because you have not presented any considerations regarding the possibility that the apparent successful outcome of the prediction might be the result of... luck/coincidence or other 'spurious' factors! Without such an analysis any 'success' report kind of only represents evidence of anecdotal value only - of which it's 'proof' by principle is doubtful. One could wonder why the world hardly ever hears reports about the many 'lifespan predictions' that in time have turned out to be incorrect!? I hope these considerations from my side make sense for you? PS. Thank you for confirming again that 'long term' predictions are by principle difficult (if not impossible) because of the dynamic nature of the hand lines. Let me make it very clear at the Outset..... I am not a researcher like you. And do not feel any need to establish facts with proofs / citation from 'Authorities' or books. As I told earlier, I am more comfortable with an observation then a lot of theories. Your posts gives me a feeling that you have not read my first narrative (written to Lynn) properly. Regarding use of spurious factors - I can not comment. Yes, in any sort of divination (as palmistry is considered in India), you need some sort of luck. And I have mentioned in my posts that some Intuition may have been there too. Here I am not concerned much that whether Researchers do accept my post as anecdotal claim or anything else of lower values. That is okay with me. Regarding long term prediction part - forget about Life span part. How many times you have come across any long term prediction about any specific event - let it be in finance / fame /awards /disease or any similar things - that palmists have given some 25 yrs back and found to be correct most of the time ? So, whatever we say - palmistry has a limitation about very long term accurate predictions. Life expectancy , the most difficult topic probably, also lies within this. I think your last words kind of reflect how many people tend to think about palmistry - they associate it with the 'predictive' branch of palmistry (because they think that palmistry has only the purpose of 'divination', e.g. predicting the future). However, I think this only represents the 'traditional' view on palmistry. The truth is that around the world palmistry today has many branches where 'divination' plays no role at all - see the most popular approaches mentioned in the sub-title of this forum... listing: Life Purpose Hand Analysis, Elemental- & PsychoDiagnostic Chirology, Vedic Palmistry & Spiritual Palm Reading. Most of those modern approaches do not focus on 'divination' at all. Sorry, I can not confirm your idea that palmistry is all about 'prediction'; because I perceive personal growth / personal awareness via self-knowledge & diagnostic applications as the highest purpose of hand reading. And in the perspective of this discussion I could add that a 'short life line' could have it's value combined with other hand features in terms of issues that relate to inner motivation. So, in my perception 'modern hand reading' is not focused on predicting the future... however at this forum we do discuss those issues as well & everybody is welcome to add & share their experiences regarding that aspect of palmistry as well! PS. Regarding your narrative to Lynn, I have the impression that Lynn took your info regarding the age of people involved likewise as I did. By the way, you have not specified why exactly you think that I have not read your words properly... so it's hard for me to comment on that perception. But I highly appreciate your efforts to discuss things properly! I am aware that Palmistry has been associated with many things and people use it for different purposes. You have listed these. But to me, it appears that you might have missed a crucial part of divination part. The divination part is also used for improvement. It is not fatalistic as many people claim. Because after Divination comes counselling and remedies. These two things make it clear that the future can be changed / improved based on understanding gained from reading of the hand. Obviously, I do not and need not agree to your observations on predictive palmistry as folklore based believe system. In other uses of palmistry (Life Purpose Hand Analysis, Elemental- & PsychoDiagnostic Chirology), the narrative we get is mainly in abstract terms. Someone with beautiful command on language (s) and some command on basic psychology can provide a descriptions...even without much expertise in Palmistry. But how one cross-check these descriptions ? Someone on Life purpose analysis says something to me - then how do I know what the person is saying is correct - how do I cross-check ? Our brain has many layers of memories in them. If someone is kept harping that in my childhood negative emotions were a-plenty - then there is strong possibility that I will remember those happenings only, forgetting the pleasant ones. When it comes to checking accuracy of any method - it should have two things. It should describe a happening (let it be anything - an event / a medical problem / a mental state like depression) with a definitive time frame. Otherwise same can not be cross-checked. If I say that someone has less brilliance of mind - he/she will never agree. If I say that someone is brilliant - he/she will always agree (Everybody thinks he/she is above average). I know I am describing it in very simplistic way - just to get my point across. I had written that the prediction appeared to be partly based on intuition. But in your comment you had attributed possibility of "luck/co-incidence / spurious factors". That gave me that impression that you might had missed that word "intuition". I understand that you and me may not agree to many a things. But I enjoyed the discussion. Very nice to hear that you enjoyed the discussion. Feel free to start a new topic in order to discuss some specific aspects of 'predictive' palmistry a little bit further. PS. I hope we can leave this topic open for further discussion about the life line. Why I focussed on Predictive Palmistry is because the person first wants to know his high and low periods in life careerwise, personal life wise, healthwise too so that he may take precautions and be ready. No doubt modern palmistry is different but still predictive palmistry still people want to know when. So if you want to keep a separate section for that it is O.K. I think your suggestion is excellent: I really like your idea to create a forum section where people can ask and answer questions regarding 'future predicitions'. Because then we can show at this forum more clearly that 'predictive palmistry' is just one of the branches in the fields of palmistry! I will discuss you idea with with the other members of the moderator-team, and then I will inform you about the outcome. Okay? Western palmists do not understand the meaning of divinity. These people can not go beyond material and as you said they use their sophisticated language which they name as modern palm reading. If prediction is removed from palmistry then this will be the fatal for this subject. Good that you replied robustly. I am bit of a wanderer.....not a serious palmist per se. But I am open to all ideas...I cannot discard any theory before I have studied it. So, I am not exclusively in predictive palmistry only. Yes, Let us keep the scope for further discussion open. Let knowledge come from all direction & all corners to us . I feel that you, I and others (Martijn, Patti, Lynn, Pravin Kumar-ji etc) all represent different ideas / different interpretations of same ideas / different view-point. Sometimes, these ideas/interpretations/view-points co-align...sometimes they differ. The discussion is about understanding everyone's view point so that we can enrich ourselves. None of us are absolutely correct or absolutely wrong. Although sometimes, we do mistakes while expressing it - may be due to inadequacy of language/words. Palmistry as an art has survived many attacks in past & it will continue even if a branch (predictive palmistry) is ignored by some of the practitioners. In the moderator team we have considered the option to create a new forum section. And though some of use found the idea appealing, and the end we agreed/concluded that 'predictive palmistry' should better not be associated with modern hand reading. However, we also arrived at an idea to present some kind of 'guideline' which describes a code of ethics - just like the Brahmans did (few people are aware that in the view of the Brahmans ancient palmistry is only meant to be used for divine purposes in the life of an ascetic/monk, and not to take anything in return... such as making money or making claims about one's knowledge). I agree, Chakraborty. Well put. I think the reason for other participants not sharing "likewise speculative ideas" may be that they don't want their arguments to be called absurd and delusional. From following discussions on here for a while now, I have come to realise that there is no point in trying to present evidence to you once you have formed an opinion about something ... and this thread proves it once again. I'm only posting because of your reference to the lack of support from other participants - I couldn't let that stand. I can follow Patti's argument, find her examples and evidence compelling, and agree with her conclusion. Kiwihands, thanks for sharing your view regarding my choice of words - I think the context outside your small quote (+ my preceeding posts) explain why I have used those words. Martijn - you wrote - "Your quote suggests that I only used those words because there was support given by others" - I think you meant to write "no support given by others"? Yes I questioned some of Patti's arguments, as we do in such debates, but no matter how much I disagree with someone's arguments, I hope I would not call my friends absurd or delusional, which could be taken as personal insults. actually I disagree with that statement, I think that if Martijn is presented with hard facts & evidence, he takes it on board. Most of our disagreements, in our more heated discussions , have been about how to interpret / apply the scientific literature. do you have evidence to prove your theories ( character reading, psyco diagnosti palmistry) are scientifical? This cannot become scientific because of the only reason that few western palmists have written book on it. Almost maximum number of peoples in this forum give predictive reading everyday or atleast support it. But we could not find your methods of so called modern techniques . It stays only at theoretical level. Can you apply psycho diagnostic methods to peoples who come with their palm pictures in this forum everyday? If you do single example everyday with successful outcome, we can atleast try to believe your theories. Otherwise, It will remain theory as it is. But there will be no practical values to those stuffs. This simple facts help us to understand the dominancy and prevalancy of predictive palmistry . No variation of western or eastern peoples in regard to it. Everybody ask for future reading. Practically, There is no exceptional to it. But I wonder on your evidentless arguments. Arguments are all about " who is right " . Discussions are all about " what is right ". We dont want the arguments. We need discussion with examples by you to read atleast one people's hand every day by using your modern method. But so far, It has not done. Also, The readings should not be based on possibilities. But, It should be stable enough especially when you say it scientifical. Thanks. Sorry Sundar, your request is in this topic about the life line. So far peoples did few touch about lifeline in this discussion. However i try to open a new discussion. Also you can open a poll to understand the prevalence of every school of palmistry. I see that peoples remind off topics when they find hard to answer . This is just a psycological observation. I found such eexpressions in some more threads as well. Sorry if you feel i am wrong. And thankx. If you start a new discussion, maybe copying your recent post here, with questions about eg "If you do single example everyday with successful outcome" etc , we can discuss it on the new thread. hi Boaz, can you explain what you mean exactly?